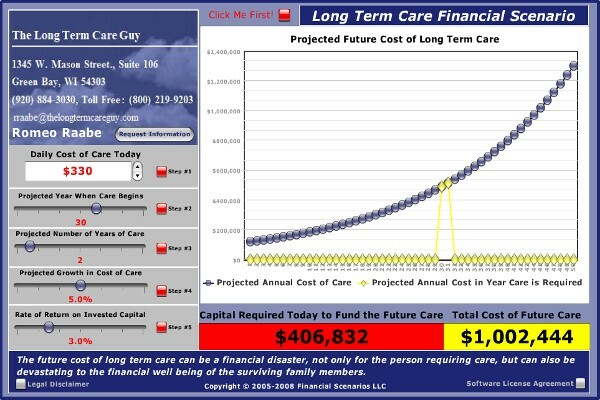 This graph below will let you calculate how much money you need to set aside today, to grow into enough money to fund your Long-Term Care (LTC) at an age when you may need help. You can move the numbers on the left side around any way you want. You choose how much money per day you will need if care were required today, then enter how many years until the day you might need care. Then guess at how many years of care might be required, the inflation rate of LTC (it will be at least 5%) and lastly, enter the growth of your nest egg as a percentage (remember, nobody has earned 10% on their stock portfolio consistently in recent years, and fixed accounts run 2% to 3%). Home care can be less or more than assisted living, depending on how many visits, duration, and cares required. This graph below will let you calculate how much money you need to set aside today, to grow into enough money to fund your Long-Term Care (LTC) at an age when you may need help. Most people have no idea what LTC costs. This calculator, and the average costs I’ve listed (not from national surveys, but from seeing actual bills from Wisconsin providers) will let you calculate how much money you need to set aside now, not over time, to fund your care in later life. These are dollars you cannot use for vacations, cruises, vacation home, helping out children or grandchildren, etc. They must be set aside to grow only to be used for LTC (or passed at death if you are in the 30% who never need such care). Now, just for fun, let me give you a comparison of using insurance to fund LTC. A 65 year old person can who is still healthy enough to purchase LTC insurance can buy a policy with a premium of just under $2000 per year. After paying this premium for 20 years, that person is now 85 and has paid in just under $40,000. At that point they start collecting on the policy to pay for their care and over the next 10 years they collect over $850,000 of LTC benefits. I will let you play with the calculator to see how much that person would have had to set aside at age 65 to do the same. (hint, it’s almost $400,000). Is LTC insurance expensive? Or, a pretty good value for the money spent? You play with the calculator and let me know. If you decide it is a good value I will help you figure out how much or how little of it you might need. Bear in mind your lifestyle will change significantly when care is needed. Less cars, toys, golf, travel, etc. means some of your income and some of your interest can pay part of the bill. Only buy enough to cover the shortfall. Investigate with an expert. This is all we do and have been doing this for 24 years. Let us help you find appropriate coverage and learn how much less that can cost than what you might have expected. Call TheLongTermCareGuy.com at (920) 884-3030 to schedule a time to investigate together.